BFIS Chairman, Michael Fisher (fourth from left) with Antionay Tankard (BFIS 2012 Graduate). Also present are Edwin Jordan, Meredith Head, Tatsuhiko Hoshina, Victoria Cunningham and Lyndsay Forrest (BFIS 2012 Intern). 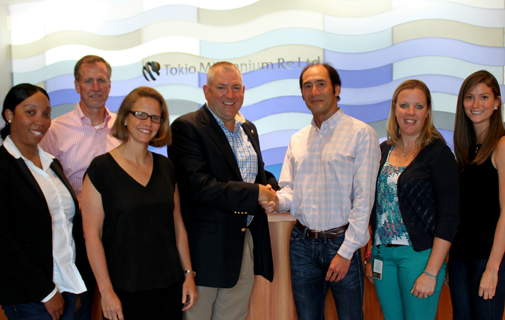 The Bermuda Foundation For Insurance Studies (BFIS) is delighted to receive a third donation of $10,000 from global reinsurer Tokio Millennium Re.